Welcome - This is a Social Enterprise Business It aims to help potters and ceramic artists to become better known, to sell their work, to fill their courses and to provide a window into this fantastic world of 3D art! Sheffield Open Studios - Antonia Salmon at 20 Adelaide Road 4th - 5th May 2019 I make hand-burnished and smoke-fired ceramic sculpture. These strong, pure forms are inspired by nature; they stand poised between movement and stillness. - Antonia Salmon. Vessel: SE group of the NPA at Cupola Contemporary Art Gallery 27th April to 1st June, 2019 Vessel is being held at the Cupola Contemporary Art Gallery in Sheffield. It is a selected exhibition for the NPA. Details of participants will follow. Students will learn about preparing clay and different techniques of ceramics from pinch pots and coiled pottery, to slab building and throwing. Students are also guided on aspects of decoration and glazing. Studio Pottery Making techniques: A terms course covers a project in each - pinching, coiling, slab building and throwing. “Workshops will now be at my studio in Worthing, W.Sussex UK and no longer be at the Angmering venue. We have successfully organised a few already this year to try everything out and very recently had the firing area covered with a large metal canopy. My prayers to the fair-weather and kiln gods now don’t have to be quite so in earnest! We can offer most of the kiln and barrel firing techniques and, to keep costs down, are initially looking to run the naked clay courses over just a couple of days. 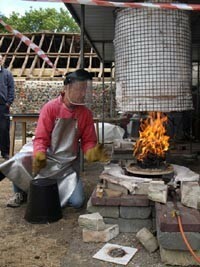 Glazed raku courses can be full or half day. The number of participants attending will initially be limited to 5 while we test out the new programmes. The workshop is very close to Worthing seafront and town centre, easily accessible by road, rail, and air (London-Gatwick), and with plenty of accommodation options close at hand. We are also able to offer limited en-suite accommodation at our house adjoining the workshop. Full details and booking forms for each workshop are on my website at www.jevceramics.co.uk. Further workshop dates will be offered during the year. We are also able to offer tailored workshops for your pottery group. Contact me to discuss further if this is of interest. Posted on December 2 2018 under News for Makers, Pottery and Ceramic Course News.